Charles Henry Holland, Jr., age 73, of Joplin passed away on Sunday April 8, 2018, at Freeman Hospital, following an illness. Charles was born on December 4, 1944 in Wheeling, West Virginia, the son of the late Charles Henry, Sr. and Ella E. (Moore) Holland. 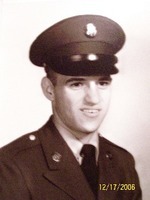 He served in the Missouri National Guard from 1964-1969. He worked many years in maintenance for Missouri Southern State University. He was a member of the Seventh Day Adventist Church in Joplin. He was very passionate about his animals. He is survived by three daughters, Karen Clark and husband Vernon, Carl Junction, Mo., Tracy Holland, Joplin, and Loretta Harris and husband Chad, Joplin; a half-brother, Joe Holland, Joplin; three half-sisters, Starlett Holland, Joplin, Kathy (Holland) Madden, Springfield, Mo, and Rebecca Holland, Springfield, Mo. ; eighteen grandchildren and thirty-two great-grandchildren. A memorial service will be 3:00 p.m. Thursday at Mason-Woodard Chapel. Reverend Roy Ames will officiate. A visitation will immediately follow the service.